Where can you get fabulous folk and rock music and great facilities to keep the whole family entertained over the Spring Bank Holiday weekend? 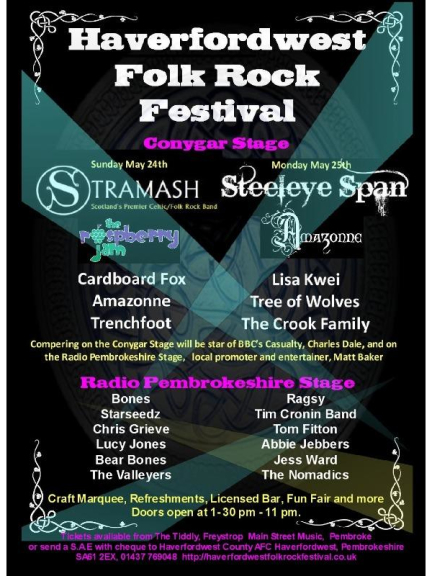 There’s a new festival in Pembrokeshire set to run over two days, which will bring the best music and entertainment right into town – the Haverfordwest Folk Rock Festival, with headline guests Steeleye Span! The place to be for fans of live music on Sunday, May 24th and Bank Holiday Monday, May 25th, is Haverfordwest County AFC, Conygar Bridge Meadows Stadium, Haverfordwest. That’s the venue for the first Haverfordwest Folk Rock Festival, which is bringing one of the biggest names in live music to the town – legendary folk-rock band Steeleye Span. They are headlining on the second night. The two day festival will feature more than 20 acts in all, including many popular local performers. The event is suitable for the whole family. As well as great music there will be a craft marquee with a range of stalls, plus there’s a bar, food, teas, coffee, candy floss, a fair, and everything a family going to a festival would want for a fun time. There is free parking next to the stadium and bus and train services are nearby. There will be two stages for the event -- one for bands, the other for soloists and duos. This will mean there will be non –stop top quality music from 2pm to 10.30pm on both days. Steeleye Span, featuring the vivacious voice of Maddy Prior, are stunning live, and have a new fiddle player in Jessie-May Smart, who is a great visual performer. Also on the bill are Scotland’s leading Celtic folk rock band, Stramash; Bones, a popular duo from Manchester; and Ragsy, Sir Tom Jones’s protégé on BBC TV’s The Voice. Kicking the festival off on the Sunday on the Radio Pembrokeshire stage will be Matt Baker, from The Tiddly, an experienced performer, who will introduce the first act, popular local band, The Valleyers. First on the Conygar Stage in the stadium will be Trenchfoot, from Laugharne. MC there will be Charles Dale from Casualty (filming permitting). Haverfordwest AFC, and Musicians World in Haverfordwest.